Sydney’s premier trainer Chris Waller continues to break records in New South Wales and tonight was presented with his eighth successive Bart Cummings Medal during the NSW Racing’s Night of Champions awards held at Royal Randwick. The Bart Cummings Medal point score – honouring the legendary trainer who passed away just under three years ago – is comprised of votes from leading Sydney racing journalists. With an incredible 189 city winners for the 2017/18 season, Waller easily passed his previous milestone of 169 wins established during the 2015/16 racing season. Waller cleared away in the Bart Cummings Medal point scores with 110 points for the season, well in advance of runner-up Jason Collett (34 points) with Brenton Avdulla finishing third on 32 points. Waller also collected the T.J. Smith Award for Sydney’s leading trainer, finishing 95 winners in advance of runner-up, James Cummings. 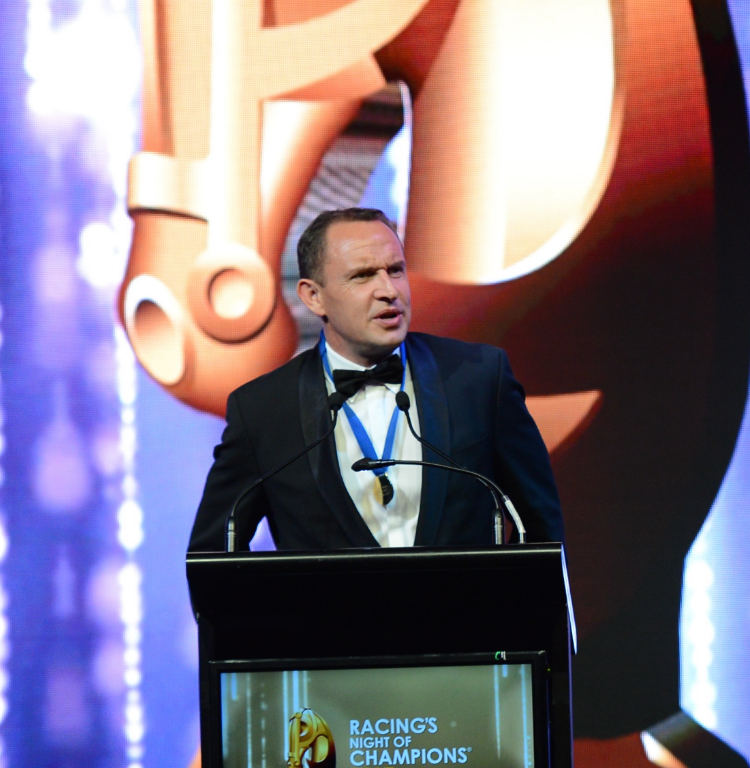 “Chris Waller is a trailblazer not just in thoroughbred racing, but in sport, and continues to set new benchmarks,” said Mr Peter V’landys AM, Racing NSW’s Chief Executive. Brenton Avdulla claimed his first George Moore Award for winning the Sydney Jockeys’ Premiership with 92 wins for the season, finishing 12 in advance of Blake Shinn. Brenton went one better than his second placing last year to Hugh Bowman. Rachel King, now a fully-fledged jockey, took out the coveted Theo Green Award for leading Sydney apprentice with 38 wins for the season. King held off a determined Jean Van Overmeire to win by 3½ winners. The NSWROA Committee acknowledged the wonderful service to the industry of the late Mr Noel Bracks by presenting his family with the NSWROA Industry Recognition Award. Epidemic (BOBS Horse of the Year): The James Cummings-trained mare stormed to four city victories during the season – three at Rosehill Gardens and one at Royal Randwick. Owned by Godolphin, Epidemic accumulated $78,750 in BOBS bonuses and beat Albumin ($73,125) and her stablemate Savatiano ($67,500) for the award.